The weather looked poor Sunday morning, with heavy dark clouds in the sky in Anchorage. I left town and was surprised to have the weather clear as I approached Crow Creek Mine. It was sunny but a bit cool at 9AM when I arrived at the mine. Brian Berkhahn was waiting when I arrived, and Jeff Reed arrived shortly after. We were all there to metal detect for gold, as were several other people that morning. I had decided to try the Tesoro Lobo SuperTRAQ detector for the day. This unit features automatic ground balance and seemed fairly powerful when I bench tested it. Other items in my kit include a set of headphones, a heavily used pick, plastic scoop for retrieving targets, and a plastic vial for my finds. A short-handle hoe/rake comes in handy for removing leaves and rubble from areas. Finally, leather gloves and bug repellent go in the rucksack, along with something to drink. 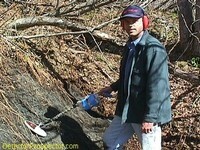 Jeff had his trusty Fisher Gold Bug 2, and Brian was sporting a Minelab XT 18000. In general, high frequency detectors work best at Crow Creek. The ground mineralization is very low, hot rocks are rare, and the gold, unfortunately, tends to be small. The White's Goldmasters (50 kHz) are very popular at the mine. I have also seen quite a few Minelab XT 18000 detectors at the mine lately, which can be set at 60 kHz. Crow Creek has been hit hard by people with detectors over the last few years, so the easy finds that can be had by simply scanning the surface are getting rare. Usually a little more work is required at this point. Crow Creek Mine is a large open hydraulic pit over 200 feet deep. It has grown up so much that it resembles a natural stream valley, but digging at any point on the banks of the creek can reveal gold-bearing material. Gold can be found hundreds of feet from the creek. Unfortunately, leaves and roots cover the material now, so a rake or hoe come in handy for trying new areas. The rest of the crew headed upstream to try some steep banks that tend to have new material slide down them in the spring. I paused to scrape the leaves from a little knoll, which was well away from the creek. I was thrilled when the very first target I got was a 7.8 grain nugget! Usually gold occurs in patches, so it is a good idea to really hit an area if you find a single piece of gold. Twenty nails later, I headed upstream to see how everyone else was doing. It seemed to be the only nugget on the hill. I'm sure there is more gold on that knoll, but it will have to wait for another day. Jeff was hitting a large slide area well upstream. A few nuggets had been found on the slope, and he had just found a small nugget. I tried the area a bit but had no luck, so I headed for another little bank right next to the creek. Jeff found no more gold, so headed downstream. My search of the bank revealed two small nuggets, 2.4 gr. and 2.3 gr., on a clay layer that headed into the bank. Again it seemed as if the gold ran out, but I am sure there is more there, so I'll be back. I headed downstream and saw one of the most interesting metal detector finds I can imagine. A large tree had been uprooted in an area known to contain good gold. The root clump was sticking out over the ground, and Jeff was detecting it. We have all heard of gold being found in roots, and I am here to report that Jeff found two gold nuggets over four feet above the ground! I searched the area and only found one more small nugget, a 1.4 grain piece perched on a little ridge-top. That brought my total for the day to 4 nuggets weighing 13.9 grains, or just over 1/2 pennyweight. I am very pleased with the Tesoro Lobo SuperTRAQ. It was very smooth, required no ground balancing, and found a 1.4 grain nugget. I found this surprising as the machine is a 17.5 kHz unit, but I would have to rate its sensitivity as equal to many of the higher frequency models available. It also features a coin-hunting discrimination mode, which makes it one of the most versatile detectors on the market. Finally, I appreciated the light weight of the unit, as my arm was out of shape for long-term detecting. It was a very pleasant day, with gold found, and nary a mosquito bite. The gold was a bit sparse... Jeff found five nuggets but my four weighed more. Some of the other guys also found a few nuggets, but nobody seemed to be having a hot day. Nugget hunting is much more hit and miss than dredging, so we'll see what future detecting days bring.